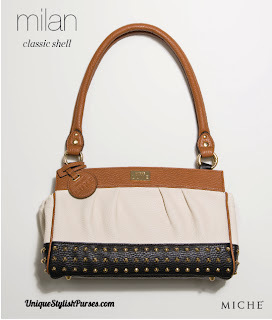 Milan Classic Luxe Shell, Haute fashion meets classic styling. Creamy faux leather with rich brown and black accents puts the spotlight on rows of gold studs and brown piping detail. This beauty also features convenient end pockets and comes with matching handles. Handle length: 22”; width: .625”; handle drop: 10”.